Did you know that eight million tons of plastic are dumped into our oceans every year? It’s a staggering estimate—equal to five grocery bags per every foot of coastline around the globe—and a major problem that governments are struggling to solve or ignoring all together. 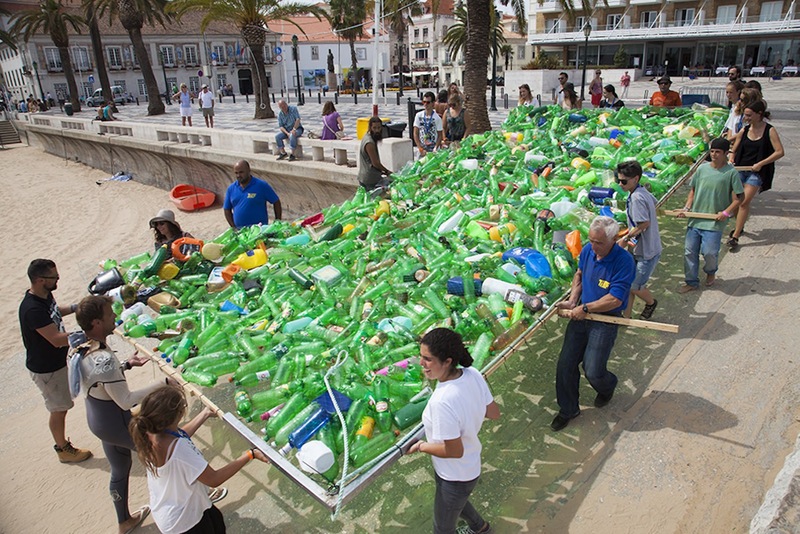 Madrid-based anonymous arts group Luzinterruptus raises awareness of the issue in their latest installation: a so-called floating “eighth continent” made from recycled plastic and garbage and temporarily buoyed in Portugal’s Cascais Bay. Luzinterruptus has a long history of raising awareness about the ills of plastic waste and consumerism through art made from locally sourced recycled materials. Inspired by a TED Talk by Charles Moore, the arts group created the “eighth continent” installation using 5,000 clean and closed plastic bottles sourced from a local recycling plant. They attached all the containers to a lightweight frame with a net to form an anchored 150-square-meter rectangular surface that they floated about 100 meters offshore from a popular beach. The designers added lights into the installation to illuminate it at night. “Our intention was to replicate, at a smaller scale, the so-called “eighth continent” made of plastic and garbage which is alarmingly taking over great areas of the Pacific,” writes Luzinterruptus. “Governments remain passive before this situation either because they lack interest or because they are incapable to solve this problem. They are allowing this huge mass of about 4 million tons of more or less crushed plastic to shape about 22,200 kilometers (about 13,794 miles) of irregular surface which goes 30 meters (about 98 feet) deep under the water, and is destroying most of the marine wildlife in the area and transforming the ecosystem.” The installation took a week to complete was exhibited for four days. Luzinterruptus hopes to make an improved version of the piece in the Pacific Ocean. Great initiative. Plastic pollution is global problem and numbers are really scary. We are turning our oceans in junk yards. Visualising the problem will probably help more people to join the cause of fighting plastic pollution. Luzinterruptus was inspired by a TED Talk by Charles Moore on the topic of plastic waste in oceans. The arts group created the “eighth continent” installation using 5,000 clean and closed plastic bottles sourced from a local recycling plant. They attached all the containers to a lightweight frame with a net to form an anchored 150-square-meter rectangular surface. The installation was floated about 100 meters offshore from a popular beach. “Our intention was to replicate, at a smaller scale, the so-called “eighth continent” made of plastic and garbage which is alarmingly taking over great areas of the Pacific,” writes Luzinterruptus. The designers added lights into the installation to illuminate it at night. The installation took a week to complete was exhibited for four days. Luzinterruptus hopes to make an improved version of the piece in the Pacific Ocean.